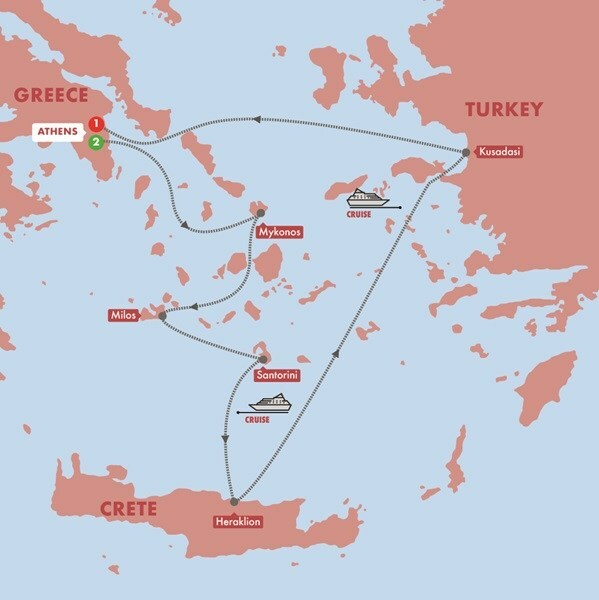 Greece's ancient history meets laid-back island life on this voyage from Athens and the glamorous islands of Mykonos and Santorini to Kusadasi. Relax in the turquoise waters of the Cyclades, admire the Venetian façades of Crete and tread in the footsteps of Socrates as you meander through the Agora marketplace of classical Greece. Welcome to a land of myths and legends. Your springboard to an intoxicating holiday in the Aegean is vibrant Athens. Spend the day exploring after being transferred to your hotel. Join a Local Specialist today for a journey into antiquity. Visit the Acropolis to see Athena's Parthenon and admire the march of the Evzone guards at the Tomb of the Unknown Soldier. Spend the afternoon at your leisure exploring the labyrinthine lanes of Plaka. A full day to delve into what was once the Cradle of Western Civilisation. See the city's ancient sites before boarding your cruise ship this evening to the Cyclades. The characteristic windmills of idyllic Mykonos greet us this morning as we look forward to a day exploring the cobbled maze of lanes on this charming island. Stroll past the white-washed cottages and tumbling cerise bougainvillea in search of hidden treasures, or simply relax on a sparkling beach. Spend time in the former home of the famous Venus de Milo to indulge in the mouth-watering watermelon pies of Milos island and soak up the glorious sunshine in the turquoise waters on one of its many beaches. Indulge in the laid-back island life of Santorini for the next two days. Enjoy a Complimentary Shore Experience to the sun-kissed clifftop village of Oia strolling past charming villages and vineyards set against the backdrop of Santorini's magnificent caldera. We return to our ship this evening where we will stay overnight. Enjoy another full day at leisure on Santorini to explore further or sit back and watch the spellbinding allure of the Aegean unfold. We sail to the island of Crete and spend the afternoon exploring the Palace of Knossos during our complimentary Shore Experience. Stop in the Turkish port city of Kusadasi for a Complimentary Shore Experience to ancient Ephesus. This morning, disembark in Athens and transfer to your hotel. Spend the rest of the day as you please. Say goodbye to your travelling companions at the end of a memorable holiday. Transfer to the airport for your flight home.